In an industrial estate in east London, Assemble, this year’s favourites for the Turner Prize, are busy at work trying to find new space for their 18-strong architectural design collective. It’s a big move for a studio that’s just been shortlisted for the art world’s most infamous prize, the first for an architectural practice and especially one that don’t describe themselves as artists. Based in an industrial complex on the peripheral of the London 2012 Olympic site, the studio was never intended to be a permanent space. It was originally earmarked for Vastint, the housing development arm of Swedish furniture giants IKEA, but in need of a large workshop Assemble agreed to move in while it was still vacant. The studio is designed as a collective space where architects, joiners, furniture designers and sculptures can all work under one roof while enjoying the benefits of cohabiting with other creatives, all working on an array of projects. The group have a very communal approach to their work, organising weekly meetings where everyone gets the chance to critique their work and lunchtime rota where they take it in turns to cook up a feast for the whole group to sit down and enjoy. The camaraderie of the group has been pivotal to Assemble’s success. Despite building some of the most talked about creative spaces in London over the past six years, the group of former Cambridge students are not your typical architects. Not everyone comes from an architectural background, some are English graduates others are furniture designers. In fact, as they’ve not yet passed their RIBA part 3 qualification, they can’t even legally call themselves architects. But they’re not your typical architects, choosing to embed themselves with the communities they work in rather than purely designing from the confines of their studio walls. It’s this hands-on approach that’s given them a reputation for building unique spaces that bring people together. After graduating from Cambridge in 2009, the group moved to London where they began working as junior architects for various studios dotted around the capital. At the same time, during the peak years of the last financial crash, artists across the city began creating pop-up venues and utilising an abundance of now neglected spaces. After reading an article in the Independent about the rise of abandoned independent petrol stations, forced into closure by an increase in petrol prices and heavy competition from supermarkets, they decided rather than create a new structure from scratch they would reuse a neglected one. With limited experience and even more limited resources, they embarked on their first project. The Cineroleum was a petrol station transformed into a golden age picture palace in the centre of London. 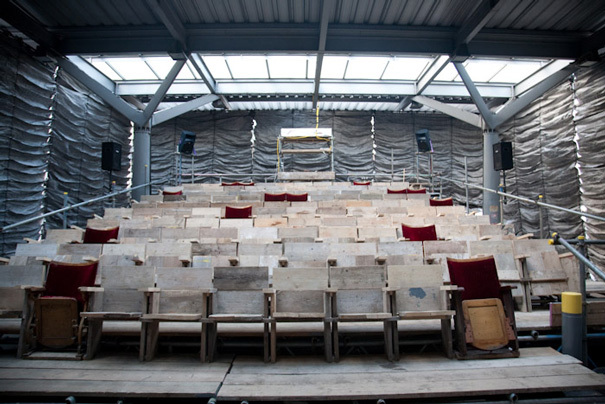 Tyvek, a type of insulating industrial packaging, was used to create metallic ruched curtains which surrounded aisles made of cheap scrap board and a screen salvaged from a skip outside the National Theatre. At the end of every film, the curtains would come up to reveal a packed house full of cinema goers to the passing traffic of one of the busiest roads in Europe. “It felt like something to do when you’re drawing toilets all day for someone else.” explained Maria Lisogorskaya, one of Assemble’s founding directors. The project gained a lot of media attention and soon after the group was approached by the Barbican arts centre to see if they could create a similar build for a new animation exhibition they were programming. At that point they became a collective. “It forced us to come up with an idea and a name,” explained Maria. The Barbican said they couldn’t pay for the structure but explained the screening would be off-site and pointed them in the direction of funders. Assemble managed to secure some money but not enough to support themselves, so they kept their full-time jobs and took extended weekends or holiday in order to be on site. The end result, Folley for a Flyover, was an arts venue located under a flyover in North London. 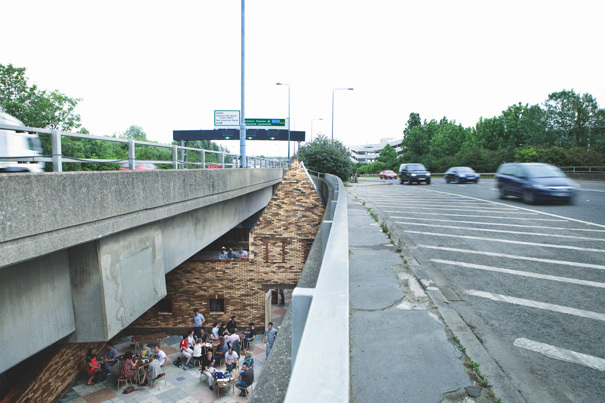 Made out of reclaimed materials, it resembled a fairy-tale house with its peak nestled in between the east and westbound traffic of the A12. Their next project was even more ambitious. Croydon Council speculatively asked them to pitch for idea for the central parade in New Addington. The area had suffered from years of gang-violence and was hit hardest during the August riots in 2011 and the proposal was to create a communal space in the middle of the struggling town. With their first full-time commission, the group needed to up their game. This time they employed a quantitative surveyor and civil engineer, people they knew from their days jobs in architectural practices. But despite the growing level of responsibilities, the collective still didn’t behave like typical architects. The upside of working with such tight budgets meant they have to be creative about their materials. Since then they’ve worked on some of London’s most innovative creative spaces. They helped transform a high-rise car park in Peckham into Franks, a bar and exhibition space that’s featured in the New York Times and Conde Nast Traveler and Café Oto’s new rehearsal space, which was crowd-built by fans of Dalston’s finest avant-garde music venue. 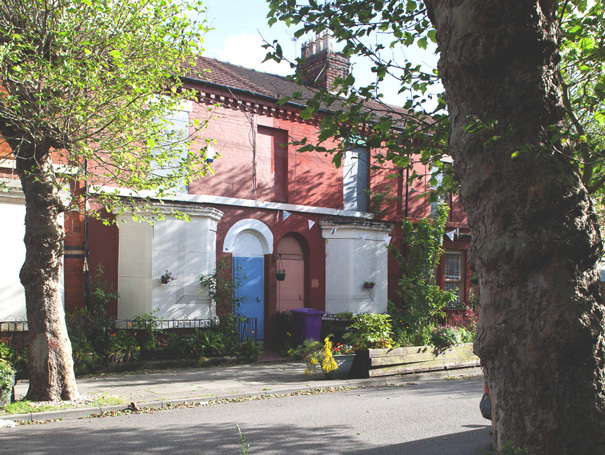 But it’s their work with Granby Four Streets CLT in Toxteth, Liverpool, that’s making them into a national name and the most controversial contenders for the nation’s biggest art prize. The CLT is a community lead initiative that’s been working for over 20 years to try and revive the most deprived areas in the country. Granby Four Streets in Toxteth used to be a thriving area, filled with shops and local businesses, but after a failed post-war regeneration, the Liverpool riots of the 1980s, and increased unemployment, the area became totally run down and derelict. Residents have moved away to the surrounding new towns of Speke and Skelmersdale, leaving their communities behind. In 1993, the remaining residents decided to do something. Since then, they’ve been fighting constant attempts by the council to clear the area. But in 2010 it looked like the fight was over for good. After eight years of campaigning against the Pathfinder programme, a housing scheme spearhead by New Labour, the group disbanded. According to an FOI, from 2003 – 2011 homes over 2,700 homes were demolished for Pathfinder purposes, leaving swathes of the area practically inhabitable. It was at the time when a group of residents took matters into their own hands. They began planting ivy, running up the sides of empty buildings and painted pictures curtains over the boarded up to make it feel inhabited again. In 2011, the Pathfinders scheme came to an end, with no more properties scheduled to be knocked down. The council hoped a private company would renovate the area but after a £25 million deal fell through, they decided to sell off the Victorian era properties as the bargain price of £1 each to anyone who could take on the massive task of renovating the now dilapidated properties. This is where Assemble come in. They had been working in Liverpool with a philanthropist on another potential project when they were approached by the CLT. 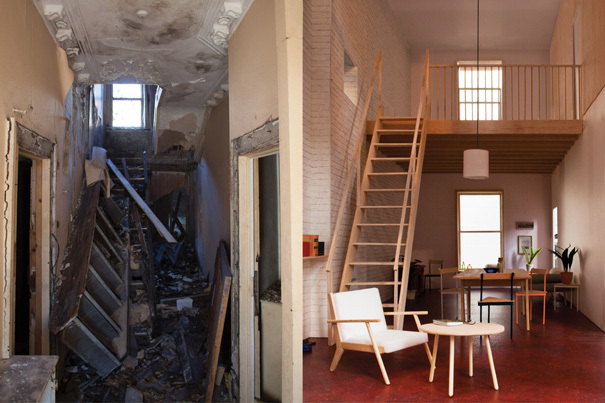 Their experience in transforming neglected properties using unconventional methods in the cheapest possible way without skimping on design has turned streets of rubble into desirable homes. I asked if the sudden spike in media attention has caused any frictions among the residents. Assemble’s creative way of showcasing the area’s potential chimes with Liverpool’s tradition of using art to combat social issues. For the city’s biennial in 2007, artist Richard Wilson cut a circular shape out of a vacant building’s facade and made it revolve, opening up the inside of the property to passersby. I wonder if housing is something the collective will be working on more in the future? Any projects the collective take on has to be interesting to all members, so they often find themselves working on an array of things at the same time. In the meantime, most of their energy will be looking for a new studio. Space is a luxury in London, and with such a large team to house they’ll be pressed to find anywhere as flexible as the studio they have at the moment. Hopefully, if they win the Turner, their new found media interest should help propel them to bigger things. And with 2:1 at the bookies saying they’ll win, the odds are defiantly in their favour.